CUANDO DIVIDIMOS UN ENTERO EN MÁS PARTES, LAS PARTES SON MAS PEQUEÑAS. SI EL ENTERO SE DIVIDE EN MENOS PARTES LAS PARTES SON MAS GRANDES. 1/3 ES MAYOR A 1/4. 1/4 ES MENOR QUE 1/2. RECORDA QUE SI NO COMPRENDES CONSULTES CON TU TUTOR. ¿CUÁL TIENE MÁS PARTES PINTADAS? 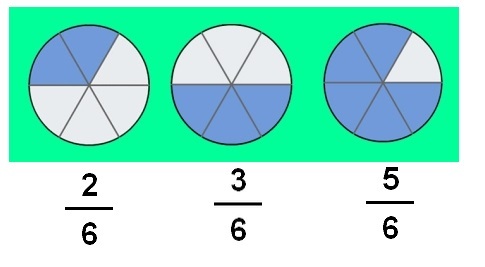 SI OBSERVAS LA IMAGEN, EL CÍRCULO QUE CORRESPONDE A 2/6 TIENE MENOS PARTES PINTADAS, POR LO QUE SE PUEDE DECIR QUE LA FRACCIÓN 2/6 ES MENOR QUE 3/6 Y QUE 5/6. ¿CUÁL TIENE MENOS PARTES PINTADAS? SI OBSERVAS LA IMAGEN, EL CÍRCULO QUE CORRESPONDE A 5/6 TIENE MÁS PARTES PINTADAS, POR LO QUE SE PUEDE DECIR QUE LA FRACCIÓN 5/6 ES MAYOR QUE 3/6 Y QUE 2/6.